"In a 3-month period, more than one-fourth of U.S. adults experience at least 1 day of back pain. It is one of our society’s most common medical problems." Back pain can be caused by many different anatomical structures and problems often simultaneously. Treat one and the others still exist and they may become worse due to the treatment. That is why we use the Millar Method of diagnosis and treatment that gets to the root cause or true cause of your back pain. We do this by using specific orthopedic, neurological, range of motion, and function test looking for deficits and how these deficits effect your sensory and motor nerves and function. Once we have identified all of your causes of pain then we can design a individual program to treat your back pain issues. • Pregnancy; kidney stones or infections; endometriosis, which is the buildup of uterine tissue in places outside the uterus; and fibromyalgia, a condition of widespread muscle pain and fatigue. • Tumors are a rare causes of back pain. Occasionally, tumors begin in the back, but more often they appear in the back as a result of cancer that has spread from elsewhere in the body. ​At Millar Chiropractic we diagnosis all of these and treat all of these except Tumors and Infections and we refer those to the UAB Dept of Neurosurgery as Millar Chiropractic Clinics is a proud member of the UAB Dept of Neurosurgery Chiropractic Care Team. We divide Back Pain into several areas: Which is your pain? The first cervical vertebra (C1) is called the Atlas. The Atlas is ring-shaped and it supports the skull. C2 is called the Axis. It is circular in shape with a blunt tooth-like structure (called the Odontoid Process or dens) that projects upward into the Atlas. Together, the Atlas and Axis enable the head to rotate and turn. The other cervical vertebrae (C3 through C7) are shaped like boxes with small spinous processes (finger-like projections) that extend from the back of the vertebrae. In addition to longer spinous processes, rib attachments add to the thoracic spine’s strength. 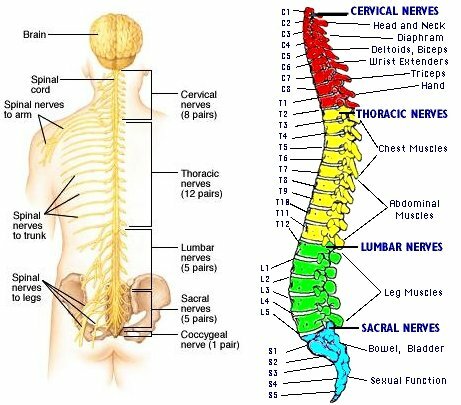 These structures make the thoracic spine more stable than the cervical or lumbar regions. In addition, the rib cage and ligament system limit the thoracic spine’s range of motion and protects many vital organs. The lumbar spine has more range of motion than the thoracic spine, but less than the cervical spine. The lumbar facet joints allow for significant flexion and extension movement but limits rotation. The Sacrum is located behind the pelvis. Five bones, abbreviated S1 through S5, fused into a triangular shape, form the sacrum. The sacrum fits between the two hip bones connecting the spine to the pelvis. The last lumbar vertebra (L5) articulates (moves) with the sacrum. Immediately below the sacrum are five additional bones, fused together to form the Coccyx (tailbone). The Pelvis or Bony Pelvis is located beside the sacrum. Located in the lower torso, the pelvis is a sturdy ring of bones that protects the organs of the abdominalpelvic cavity while anchoring the powerful muscles of the hip, thigh, back and abdomen. Several bone unite to form the bony pelvis including the sacrum, coccyx, and the left and right illium, ischium, and cozal (hip) bones. Throughout childhood, the pelvis is made of many smaller bones that eventually fuse during early adulthood to form the more rigid bony pelvis. Chiropractic is an effective treatment for Neck Pain with or without radiating pain into the arms. In a study funded by NIH’s National Center for Complementary and Alternative Medicine to test the effectiveness of different approaches for treating mechanical neck pain, 272 participants were divided into three groups that received either spinal manipulative therapy (SMT) from a doctor of chiropractic (DC), pain medication (over-the-counter pain relievers, narcotics and muscle relaxants) or exercise recommendations. After 12 weeks, about 57 percent of those who met with DCs and 48 percent who exercised reported at least a 75 percent reduction in pain, compared to 33 percent of the people in the medication group. After six months, approximately 53 percent of the drug-free groups continued to report at least a 75 percent reduction in pain; compared to just 38 percent pain reduction among those who took medication. In treating Neck Pain the Chiropractor will chose either manual (by hand) or instrument adjusting. Both have been demonstrated by numerous studies to be equally effective in treating Neck Pain. For complex cases involving disc related problems the Chiropractor will most probably recommend some form of decompression traction of the cervical spine. He may also use lasers and other modalities such as e-stim and ultrasound to treat the soft tissues that surround the neck. Chiropractic has also been shown to be effective in treating Upper Back Pain also called Mid Back Pain. Again the Chiropractor will use either manual or instrument adjusting. He may also use a drop table to help make the chiropractic manipulative therapy (the adjustment) softer and easier on the patient. Pain in the upper back is becoming so common with the use of computers and our slouching all day at work. AMA Recommends Chiropractic Before Resorting to Surgery: The Journal of the American Medical Association released new guidelines for back pain treatment that encouraged patients to seek chiropractic and physical therapy before resorting to surgery. Chiropractic as Effective as Epidural Injections for Lumbar Disc Herniation: Patients with lumbar disc herniation were randomly assigned to receive either nerve root injections or chiropractic care. Overall, 76% of chiropractic patients reported feeling “better” or “much better” after treatment compared to just 62.5% of injection patients. Chiropractic Best Option for SI Joint Pain: Chiropractic care was better than physical therapy or injections of corticosteroids for sacroiliac joint dysfunction. Chiropractic Reduces Herniated Disc Pain: This study provided chiropractic adjustments to 148 patients who had been diagnosed with a herniated disc. Eighty-eight percent of patients reported pain relief even up to six-months after treatment. Chiropractic Eases Back-Related Leg Pain (sciatica) : Leg pain is a common symptom that some back pain patients experience. This 2014 study, in the Annals of Internal Medicine, finds that chiropractic adjustments with home exercises have a “clinically important advantage” over exercises alone for this type of pain. So these and hundreds of other studies are in and Chiropractic is clearly the right choice for Low Back Pain and Sciatica.